Michael Brown's diving header edged Portsmouth into the second round of the Carling Cup after a hard-fought victory over League Two side Stevenage. Nadir Ciftci's close-range header from Matt Richie's corner opened the scoring for last season's quarter-finalists. But Stevenage hit back when Darren Murphy's 20-yard drive took a deflection and beat Jamie Ashdown. Brown met Joel Ward's cross to put the Championship side ahead again before Pompey closed out the game. "We created some very good chances against a decent outfit with some very expensive players. "What I didn't like in the first half were the moments when we sat back on the game, when we showed them too much respect and a lack of belief in ourselves. "The sooner our younger players learn that they're capable of winning and succeeding, the better for us all." 90:00+3:36 The referee signals the end of the game. 90:00+3:02 Chris Beardsley (Stevenage) caught offside. Indirect free kick taken left-footed by Jamie Ashdown (Portsmouth) from own half, resulting in open play. 90:00+2:28 Attacking throw-in by Scott Laird (Stevenage). 90:00+1:48 Attacking throw-in by Joel Ward (Portsmouth). 90:00+1:36 Defending throw-in by Joel Ward (Portsmouth). 90:00+1:25 Defending throw-in by Scott Laird (Stevenage). 90:00+0:42 Defending throw-in by Joel Ward (Portsmouth). 89:09 Header by Chris Beardsley (Stevenage) from left side of penalty area (18 yards), missed left. Goal kick taken long by Jamie Ashdown (Portsmouth). 86:40 Outswinging corner from left by-line taken left-footed by Matt Ritchie (Portsmouth) to centre, resulting in open play. Goal kick taken long by Chris Day (Stevenage). 85:41 Shot by Nadir Ciftci (Portsmouth) right-footed from right channel (25 yards), over the bar. Goal kick taken long by Chris Day (Stevenage). 84:35 Foul by Richard Hughes (Portsmouth) on Scott Laird (Stevenage). Direct free kick taken left-footed by Scott Laird (Stevenage) from own half, resulting in open play. 84:05 Attacking throw-in by Joel Ward (Portsmouth). 82:46 Chris Beardsley (Stevenage) caught offside. Indirect free kick taken left-footed by Jamie Ashdown (Portsmouth) from own half, resulting in open play. 82:19 Attacking throw-in by Scott Laird (Stevenage). 81:30 Attacking throw-in by Scott Laird (Stevenage). 80:59 Foul by Chris Beardsley (Stevenage) on Joel Ward (Portsmouth). Direct free kick taken left-footed by Jamie Ashdown (Portsmouth) from own half, resulting in open play. 79:55 Shot by Charlie Griffin (Stevenage) right-footed from left channel (25 yards), over the bar. Goal kick taken long by Jamie Ashdown (Portsmouth). 79:02 Goal kick taken long by Jamie Ashdown (Portsmouth). 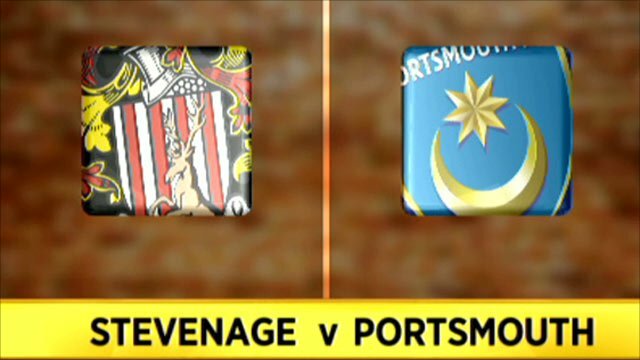 78:41 Header by Nadir Ciftci (Portsmouth) from centre of penalty area (12 yards), save (caught) by Chris Day (Stevenage). 77:04 Goal kick taken long by Jamie Ashdown (Portsmouth). 77:04 Substitution Portsmouth substitution: Hayden Mullins replaced by Peter Gregory (tactical). 77:04 Inswinging corner from right by-line taken left-footed by Joel Byrom (Stevenage) to near post, clearance by Michael Brown (Portsmouth). Shot by Peter Winn (Stevenage) right-footed from right channel (20 yards), over the bar. 76:33 Attacking throw-in by Ronnie Henry (Stevenage). Correction - 75:30 Inswinging corner from left by-line taken right-footed by Ronnie Henry (Stevenage) to far post, resulting in open play. Blocked by Ibrahima Sonko (Portsmouth). Correction - 75:30 Substitution Stevenage substitution: Robert Sinclair replaced by Peter Winn (tactical). 75:30 Inswinging corner from left by-line taken right-footed by Ronnie Henry (Stevenage) to far post, resulting in open play. 75:30 Substitution Stevenage substitution: Robert Sinclair replaced by Peter Winn (tactical). 75:30 Shot by Lee Boylan (Stevenage) right-footed from right side of penalty area (18 yards), missed left. 75:07 Shot by David Nugent (Portsmouth) left-footed from centre of penalty area (18 yards), save (caught) by Chris Day (Stevenage). 74:37 Shot by Charlie Griffin (Stevenage) right-footed from right channel (25 yards), save (caught) by Jamie Ashdown (Portsmouth). 72:40 Shot by David Nugent (Portsmouth) right-footed from right channel (25 yards), missed left. Goal kick taken long by Chris Day (Stevenage). 71:54 Defending throw-in by Matt Ritchie (Portsmouth). 71:01 Goal kick taken long by Jamie Ashdown (Portsmouth). 70:40 Attacking throw-in by Scott Laird (Stevenage). 70:32 Defending throw-in by Ronnie Henry (Stevenage). 70:02 Attacking throw-in by Matt Ritchie (Portsmouth). 69:07 Defending throw-in by Joel Ward (Portsmouth). 69:07 Substitution Stevenage substitution: Yemi Odubade replaced by Lee Boylan (tactical). 68:04 Defending throw-in by Joel Ward (Portsmouth). 66:43 Inswinging corner from left by-line taken right-footed by Ronnie Henry (Stevenage) to far post, shot by Yemi Odubade (Stevenage) right-footed from right channel (20 yards), blocked by Michael Brown (Portsmouth). 65:57 Foul by Chris Beardsley (Stevenage) on Ibrahima Sonko (Portsmouth). Direct free kick taken left-footed by Jamie Ashdown (Portsmouth) from own half, resulting in open play. 65:20 Attacking throw-in by Ronnie Henry (Stevenage). 64:38 Goal kick taken short by Jamie Ashdown (Portsmouth). 63:22 Corner from left by-line taken short left-footed by Michael Brown (Portsmouth). 62:37 Inswinging corner from right by-line taken left-footed by Matt Ritchie (Portsmouth) to near post, clearance by Michael Bostwick (Stevenage). 61:50 Attacking throw-in by Scott Laird (Stevenage). 60:39 Goal kick taken short by Jamie Ashdown (Portsmouth). 60:05 Attacking throw-in by Ronnie Henry (Stevenage). 59:18 Attacking throw-in by Joel Ward (Portsmouth). 58:46 Attacking throw-in by Matt Ritchie (Portsmouth). 57:45 Goal kick taken short by Jamie Ashdown (Portsmouth). 57:14 Attacking throw-in by Scott Laird (Stevenage). 57:00 Attacking throw-in by Scott Laird (Stevenage). 56:51 Defending throw-in by Scott Laird (Stevenage). 56:19 Goal kick taken long by Chris Day (Stevenage). 54:10 Foul by Mark Roberts (Stevenage) on Hayden Mullins (Portsmouth). Free kick taken right-footed by David Nugent (Portsmouth) from right channel (20 yards), missed right. Goal kick taken long by Chris Day (Stevenage). 53:37 Attacking throw-in by Matt Ritchie (Portsmouth). 53:01 Goal kick taken short by Jamie Ashdown (Portsmouth). 52:12 Matt Ritchie (Portsmouth) caught offside. Indirect free kick taken right-footed by Chris Day (Stevenage) from own half, resulting in open play. 51:20 Shot by Michael Bostwick (Stevenage) right-footed from right channel (25 yards), save (tipped round post) by Jamie Ashdown (Portsmouth). Corner from left by-line taken short left-footed by Charlie Griffin (Stevenage). Goal kick taken short by Jamie Ashdown (Portsmouth). 50:27 Attacking throw-in by Ronnie Henry (Stevenage). 47:47 Attacking throw-in by Joel Ward (Portsmouth). 47:05 Attacking throw-in by Matt Ritchie (Portsmouth). 46:57 Attacking throw-in by Matt Ritchie (Portsmouth). 45:58 Foul by Scott Laird (Stevenage) on Nadir Ciftci (Portsmouth). Free kick crossed left-footed by Matt Ritchie (Portsmouth) from right wing, resulting in open play. Attacking throw-in by Robert Sinclair (Stevenage). 45:37 Defending throw-in by Scott Laird (Stevenage). 45:01 Substitution Stevenage substitution: Darren Murphy replaced by Stacy Long (injury). 45:00+3:30 The players leave the pitch at half time. 45:00+2:48 Shot by Hayden Mullins (Portsmouth) right-footed from right channel (25 yards), missed right. Goal kick taken long by Chris Day (Stevenage). 45:00+2:04 Attacking throw-in by Matt Ritchie (Portsmouth). 45:00+1:25 Nadir Ciftci (Portsmouth) caught offside. Indirect free kick taken right-footed by Chris Day (Stevenage) from own half, resulting in open play. 45:00+0:39 Foul by Scott Laird (Stevenage) on Joel Ward (Portsmouth). Direct free kick taken right-footed by Ibrahima Sonko (Portsmouth) from own half, passed. 45:00+0:18 Attacking throw-in by Ronnie Henry (Stevenage). 44:52 Shot by Darren Murphy (Stevenage) drilled right-footed from right channel (30 yards), blocked by Richard Hughes (Portsmouth). 44:32 Attacking throw-in by Ronnie Henry (Stevenage). 43:51 Foul by Michael Brown (Portsmouth) on Robert Sinclair (Stevenage). Direct free kick taken right-footed by Chris Day (Stevenage) from own half, resulting in open play. 43:36 Attacking throw-in by Matt Ritchie (Portsmouth). 43:01 Defending throw-in by Scott Laird (Stevenage). 41:02 Header by Darren Murphy (Stevenage) from centre of penalty area (12 yards), over the bar. Goal kick taken short by Jamie Ashdown (Portsmouth). 40:11 Foul by Richard Hughes (Portsmouth) on Yemi Odubade (Stevenage). Direct free kick taken right-footed by Ronnie Henry (Stevenage) from left channel, resulting in open play. 39:18 Defending throw-in by Joel Ward (Portsmouth). 39:00 Defending throw-in by Joel Ward (Portsmouth). 38:03 Corner from right by-line taken short right-footed by Nadir Ciftci (Portsmouth). 37:13 Foul by Darren Murphy (Stevenage) on Michael Brown (Portsmouth). Free kick taken right-footed by Marc Wilson (Portsmouth) from right channel (25 yards), hit wall. 35:50 Assist (cross) by Joel Ward (Portsmouth) from right wing. 35:50 GOAL - Michael Brown:Stevenage 1 - 2 Portsmouth Headed goal by Michael Brown (Portsmouth) (bottom-left of goal) from centre of penalty area (12 yards).Stevenage 1-2 Portsmouth. 34:34 Foul by Marc Wilson (Portsmouth) on Chris Beardsley (Stevenage). Direct free kick taken right-footed by Ronnie Henry (Stevenage) from right wing, resulting in open play. 34:08 Goal kick taken long by Chris Day (Stevenage). 33:03 Attacking throw-in by Joel Ward (Portsmouth). 32:50 Defending throw-in by Matt Ritchie (Portsmouth). 31:30 Defending throw-in by Ronnie Henry (Stevenage).Foul by Chris Beardsley (Stevenage) on Matt Ritchie (Portsmouth). Direct free kick taken left-footed by Marc Wilson (Portsmouth) from own half, passed. 29:14 Shot by Nadir Ciftci (Portsmouth) right-footed from centre of penalty area (12 yards), over the bar. Goal kick taken long by Chris Day (Stevenage). 27:18 Attacking throw-in by Ronnie Henry (Stevenage). 26:31 Defending throw-in by Matt Ritchie (Portsmouth). 25:19 Foul by Chris Beardsley (Stevenage) on Ibrahima Sonko (Portsmouth). Direct free kick taken right-footed by Joel Ward (Portsmouth) from own half, passed. Defending throw-in by Ronnie Henry (Stevenage). 24:06 Shot by Joel Byrom (Stevenage) left-footed from left channel (25 yards), missed right. Goal kick taken short by Jamie Ashdown (Portsmouth). 23:14 Attacking throw-in by Joel Ward (Portsmouth). 22:50 Defending throw-in by Scott Laird (Stevenage). 21:55 Attacking throw-in by Ronnie Henry (Stevenage). 20:47 Attacking throw-in by Ronnie Henry (Stevenage). 20:23 Attacking throw-in by Ronnie Henry (Stevenage). 20:04 Attacking throw-in by Ronnie Henry (Stevenage). 18:03 GOAL - Darren Murphy:Stevenage 1 - 1 Portsmouth Goal by Darren Murphy (Stevenage) right-footed (bottom-left of goal) from left channel (30 yards).Stevenage 1-1 Portsmouth. 17:44 Attacking throw-in by Scott Laird (Stevenage). 17:23 Attacking throw-in by Scott Laird (Stevenage). 17:00 Defending throw-in by Scott Laird (Stevenage). 16:16 Foul by Nadir Ciftci (Portsmouth) on Scott Laird (Stevenage). Direct free kick taken right-footed by Chris Day (Stevenage) from own half, resulting in open play. 14:46 Defending throw-in by Scott Laird (Stevenage). 14:21 Goal kick taken short by Chris Day (Stevenage). 13:20 Defending throw-in by Matt Ritchie (Portsmouth). 12:37 Foul by Robert Sinclair (Stevenage) on John Utaka (Portsmouth). Direct free kick taken left-footed by Jamie Ashdown (Portsmouth) from own half, resulting in open play. 12:11 Foul by Nadir Ciftci (Portsmouth) on Scott Laird (Stevenage). Direct free kick taken right-footed by Mark Roberts (Stevenage) from own half, resulting in open play. 11:40 Goal kick taken long by Chris Day (Stevenage). 9:52 Defending throw-in by Ronnie Henry (Stevenage). 9:29 Shot by Darren Murphy (Stevenage) right-footed from right channel (20 yards), blocked by Ibrahima Sonko (Portsmouth). 6:51 Assist (cross) by Matt Ritchie (Portsmouth) from right by-line. 6:51 GOAL - Nadir Ciftci:Stevenage 0 - 1 Portsmouth headed goal by Nadir Ciftci (Portsmouth) (top-left of goal) from right side of six-yard box (6 yards).Stevenage 0-1 Portsmouth. 6:24 Defending throw-in by Matt Ritchie (Portsmouth). 5:54 Attacking throw-in by Ronnie Henry (Stevenage). 5:26 Foul by Mark Roberts (Stevenage) on Joel Ward (Portsmouth). Direct free kick taken left-footed by Jamie Ashdown (Portsmouth) from own half, passed. 4:56 Attacking throw-in by Scott Laird (Stevenage). 4:22 Goal kick taken long by Chris Day (Stevenage). 3:46 Foul by Chris Beardsley (Stevenage) on Marc Wilson (Portsmouth). Direct free kick taken left-footed by Marc Wilson (Portsmouth) from own half, passed. 3:29 Defending throw-in by Ronnie Henry (Stevenage). 3:05 Defending throw-in by Joel Ward (Portsmouth). 2:52 Attacking throw-in by Scott Laird (Stevenage). 2:39 Defending throw-in by Scott Laird (Stevenage). 2:18 Defending throw-in by Joel Ward (Portsmouth). 1:14 Goal kick taken long by Chris Day (Stevenage). 0:25 Defending throw-in by Matt Ritchie (Portsmouth). 0:14 Defending throw-in by Ronnie Henry (Stevenage).